An account of the final few weeks of The deXter Bentley Hello GoodBye Show on Resonance 104.4 FM on Denmark Street in Central London, from the period of 31st march 2007 to 7th July 2007. Featuring live music with; The Wave Pictures, Andy Hankdog, Blanket, Michael Tyack, Hands On Heads, Petra Jean Phillipson, Congregation, Sandy Dillon (The Speakeasy Quartet), Hexicon, Gasp! Cracking Eggs, Les Enfants, Team B, 7 Hertz, Benjamin Wetherill, Arthur Brick and Nic Dawson Kelly. Presented by deXter Bentley, Simon Dye & Ean Ravenscroft. Live sound engineers: Michael Garrad, Robin ‘The Fog’ Warren & Clare Tavernor. Filmed and edited by video artist James Alec Hardy (aka James III). 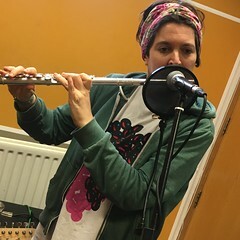 This entry was posted in dexter bentley, hello goodbye show, Live Radio on Film, Miscellaneous, resonance fm and tagged arts, dexter bentley, fly on the wall, hello goodbye show, james alec hardy, james III, live, music, radio, resonance fm. Bookmark the permalink.